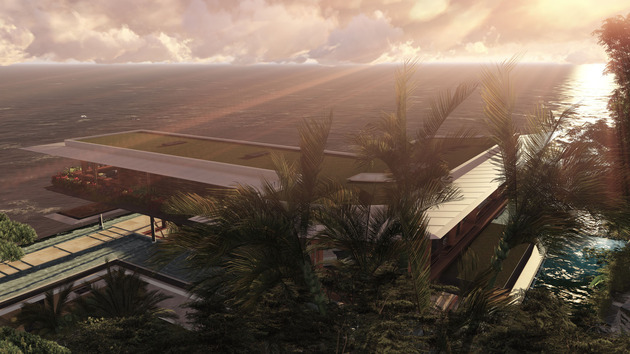 The Xalima Island House was conceived by Martin Ferrero Architecture to be a “Poem to the horizon framed by the sea”. 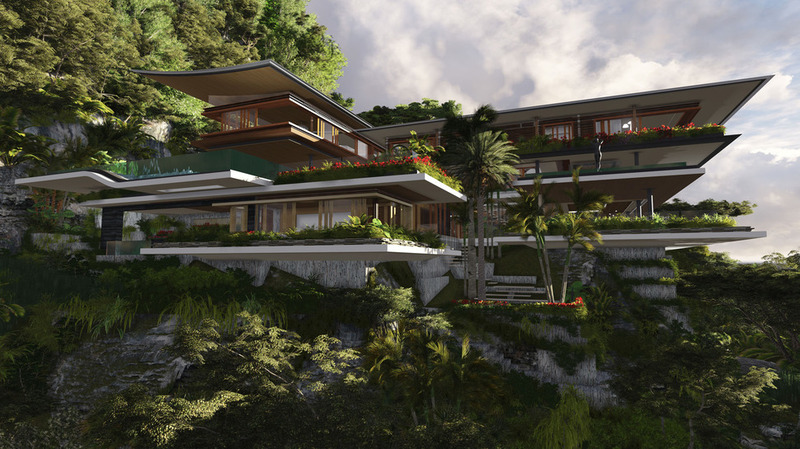 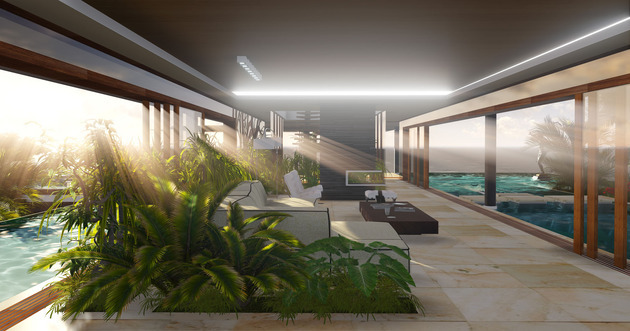 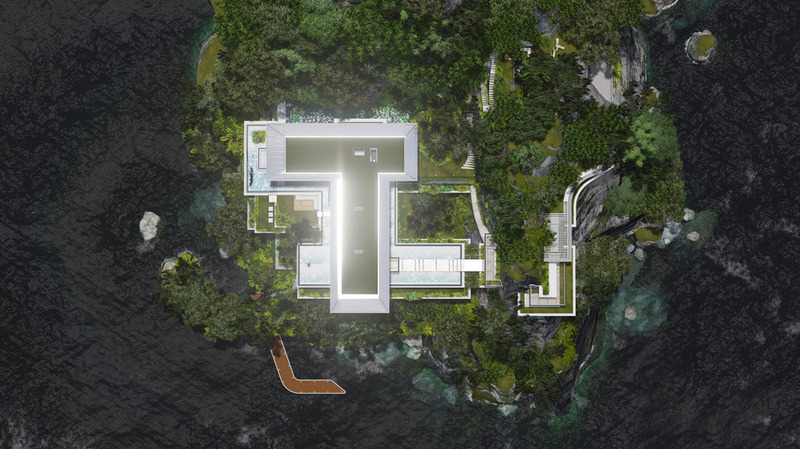 The concept is a layered one that starts with the horizon and travels across the sea to the island and up a cliff before arriving at the Xalima Island House which is presented in layers of luxury starting with a main level, then the pool level then two more levels of luxury living. 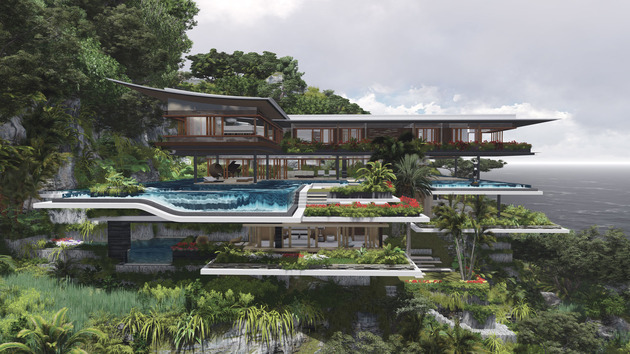 Adding to the dreamy aspect of the home is the lush plantings that wrap the social volumes creating a connectivity to the landscape from its rocky perch. 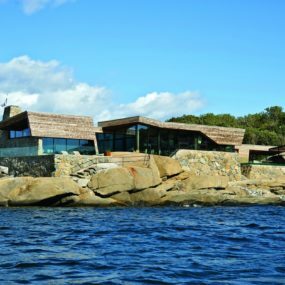 The home is designed to be perched on a cliff in such a way that while magnificent in appearance up close, from a distance it melds with the various planes of the rock face. This merging with the landscape is as important from the ocean’s perspective as it is from the lands. 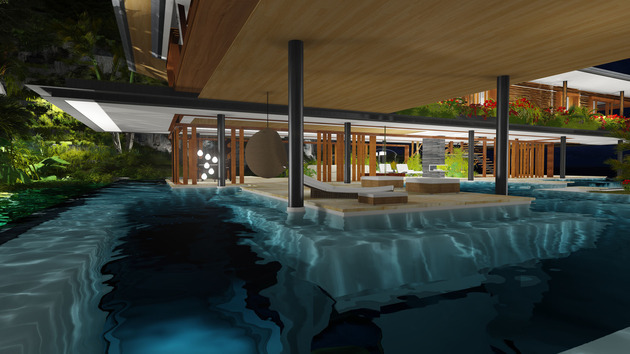 The pool is featured on one of the many layers to the Xalima Island House and is designed in such a way as to have both sheltered and exposed sections. 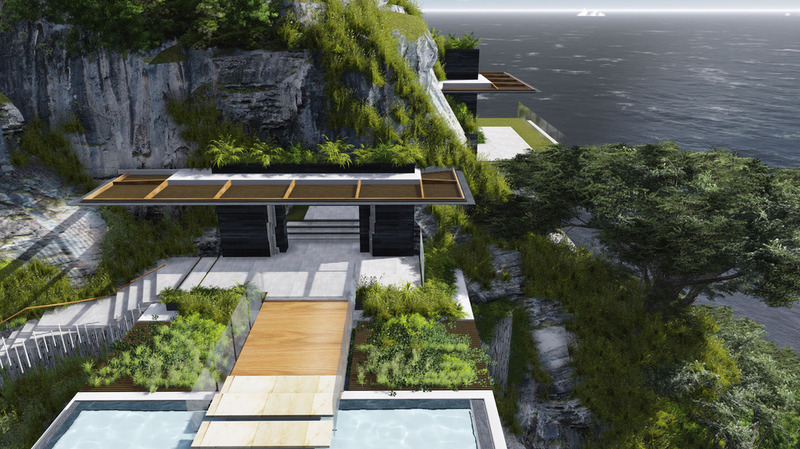 As with the pool, the various levels of the home each have roof overhangs that create shelter and shade to the walls of glazings overlooking the sea. 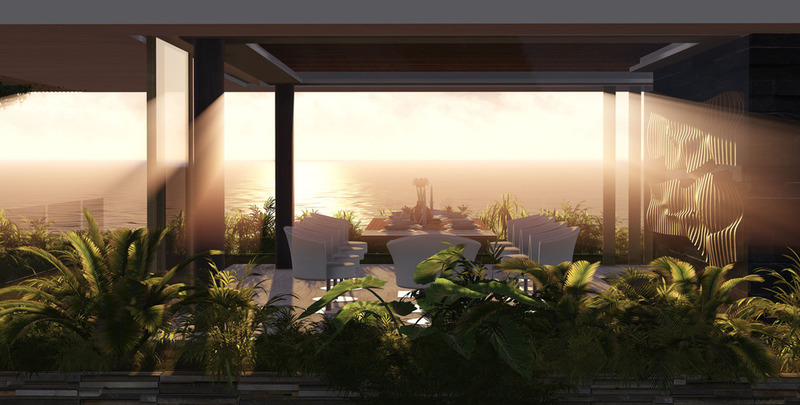 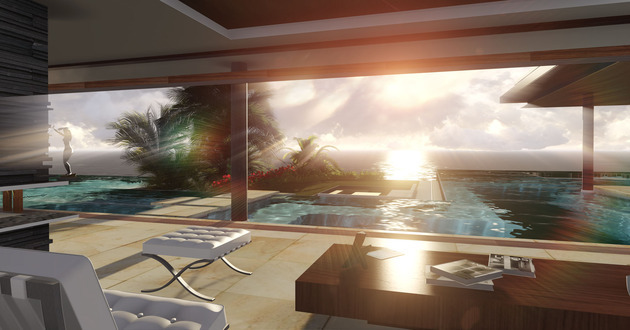 Each level within the home is also landscaped to create living elements within the lifestyle of the island home. 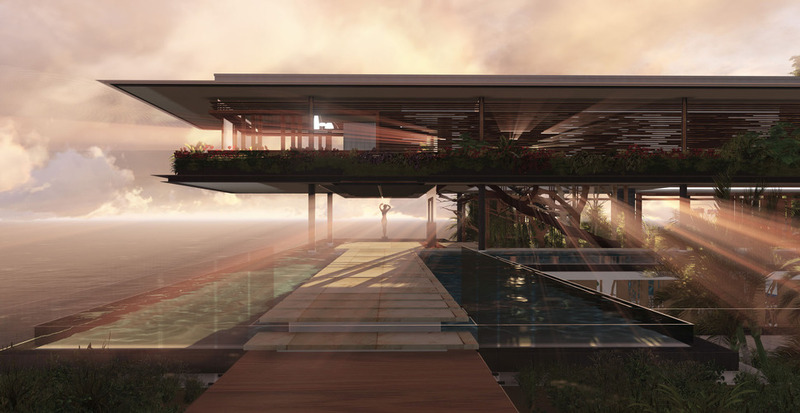 The silhouette of the home appears to reach for the sky with its various cantilevers. 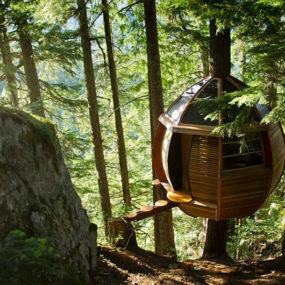 How incredibly awesome would it be to have a home with such exciting moments on each level, whether inside or out. 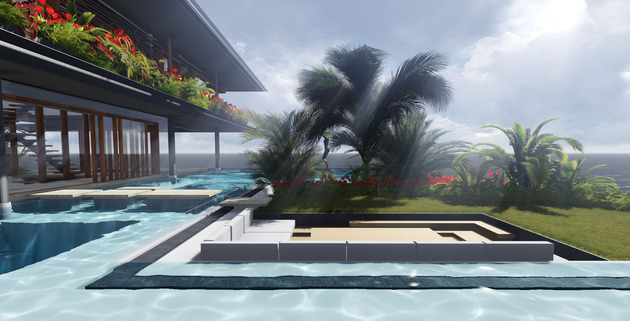 The pool is a water oasis that can be used for swimming, relaxing on the perimeter below water seats or on lounge chairs located in shallow water. 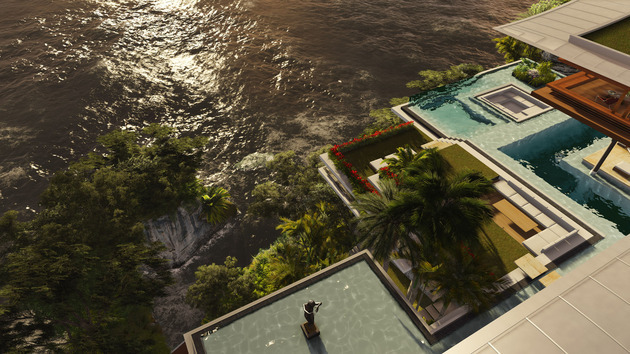 There are also several above water terraces for those that prefer a dry experience. 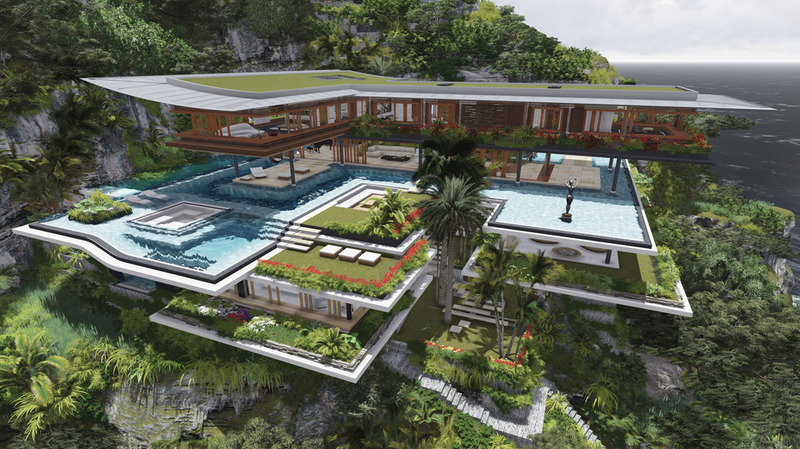 Around the edges of the pool lush plantings in various sizes and shapes create a beautiful landscape against the rock face of the cliff. 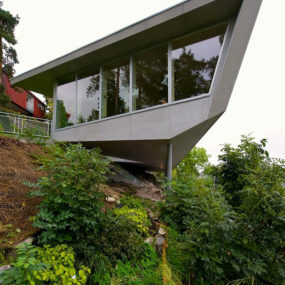 There are even sections of lawn. From the floors above, the pool seems to merge with the sea just as the man made landscape merges with the natural flora of the cliff. 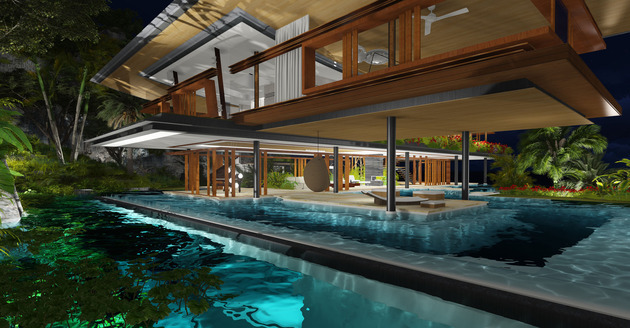 Centrally located in the pool is an outdoor lounge complete with fireplace and cozy furnishings. 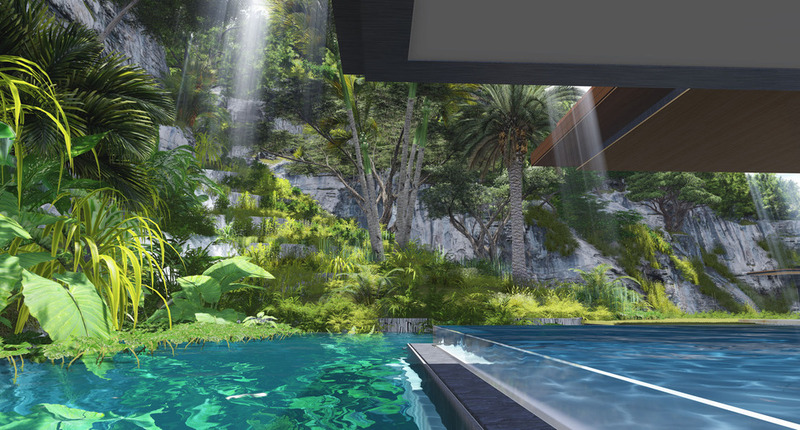 Here, too, lush plants make a statement while at the same time offering privacy to those curled up on the couch. 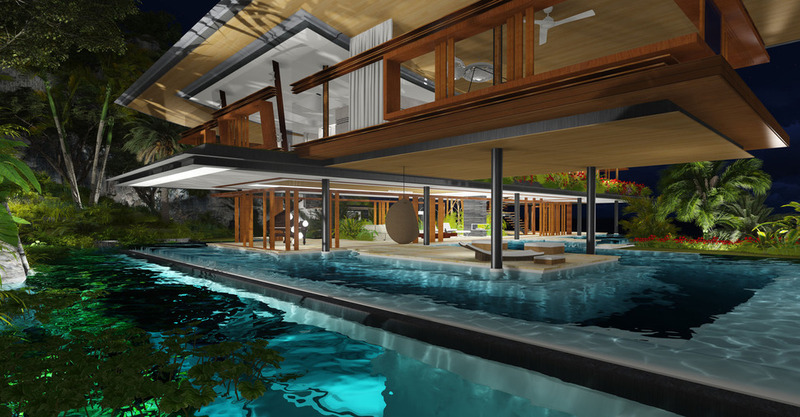 Concrete pavers lead from the lounge area, across the surface of the pool to the lawn on the other side. Within the lawn area an L shaped bench is kept warm in the evenings by an outdoor firepit. 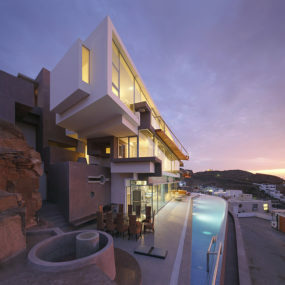 What an amazing place to stargaze. 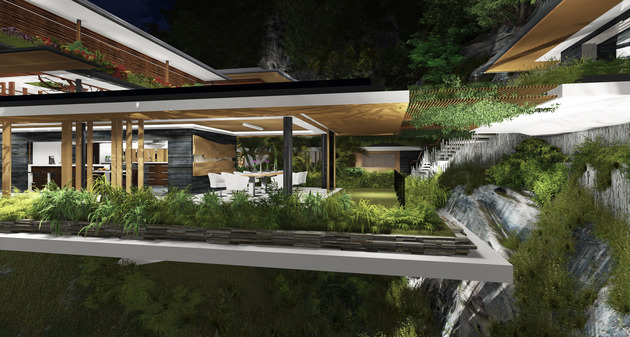 If you like star gazing the green roof offers an uninterrupted view of the heavens above. 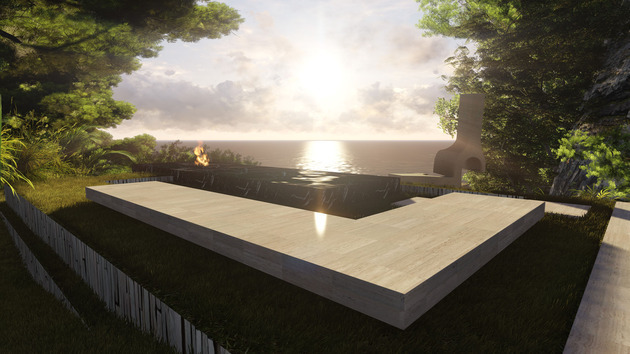 Before the stargazing begins, important things like dinner are part of the days events, and what better place to prepare a meal then in a stunning chefs kitchen, surrounded by nature and open to the elements. The dining zone next to the kitchen is large enough to seat 10 and positioned to take advantage of the panoramic ocean vistas. 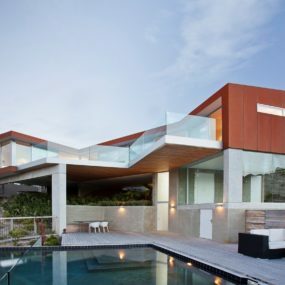 Stairs, positioned on a central stringer lead from each level to the next. 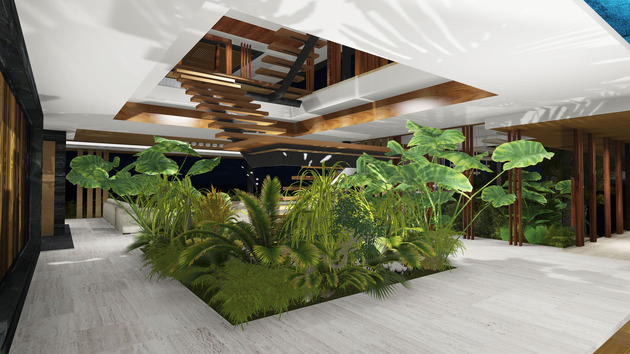 Designed to be an open riser and solid wood slab tread, the stairs create a geometric repeat pattern amidst the organic elements of the foliage, rock face and sea. The stairs are a stunning sculptural moment as they travel through the central void of the home. The living zone is located at the base of the stairwell and consists of an indoor outdoor environment bathed in natural light during the day and ambient light in from the ceiling above in the evening. 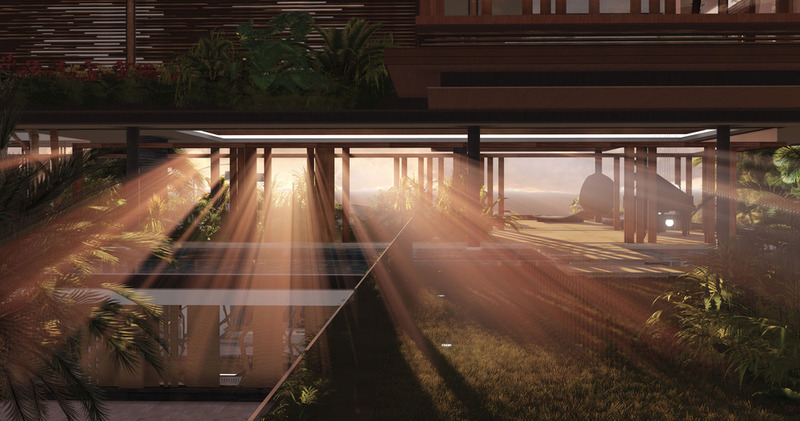 The natural lighting effects are envisioned to create a surreal atmosphere as day shifts to night and the sun is low on the horizon. 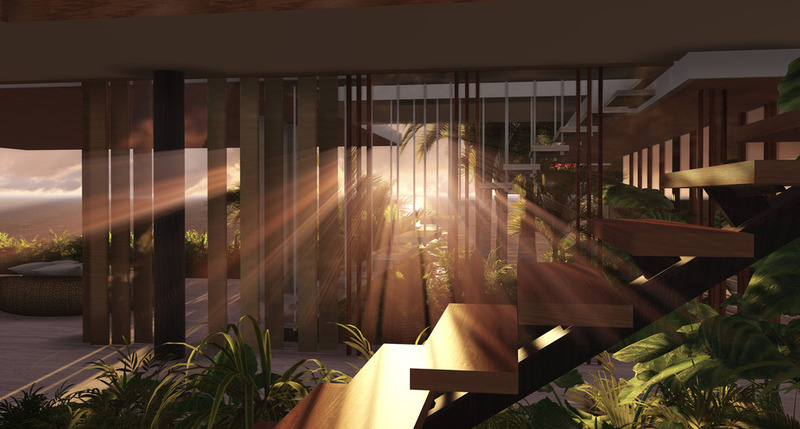 A well placed sculpture is framed by the setting sun and presents an eloquent visual to the poem that is the home. 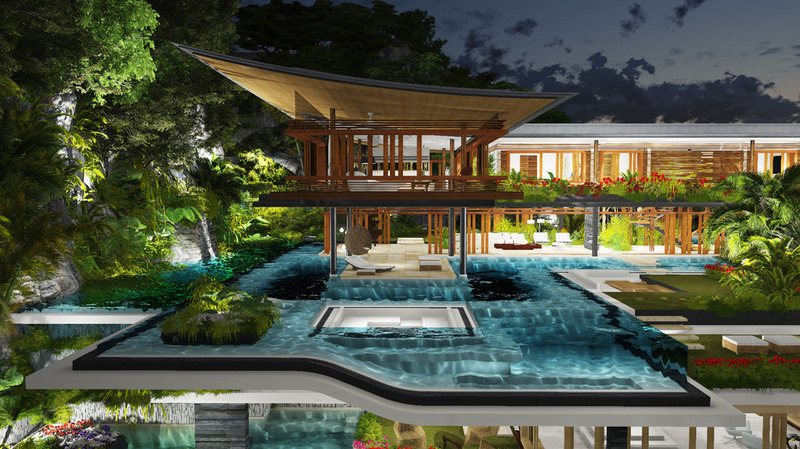 As night falls the Xalima Island House sparkles amidst its backdrop of greenery and sea. 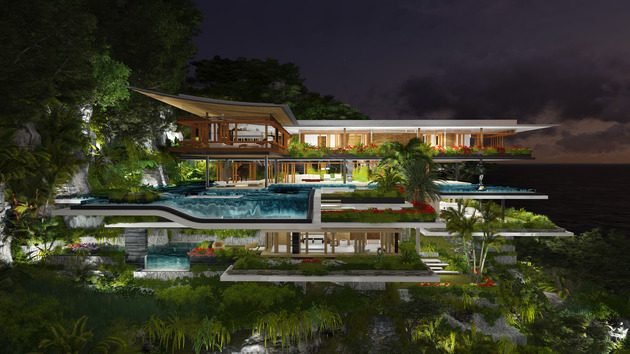 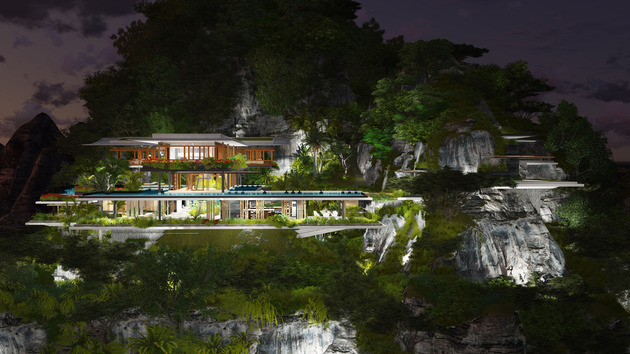 Even at night, the design of the home works with the cliff face it is positioned on. 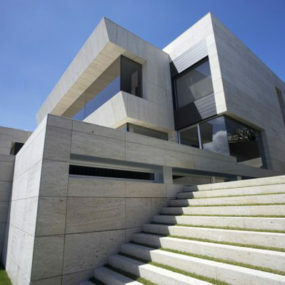 This accomplishment is largely based on the well positioned vegetation within the many voids of the home. 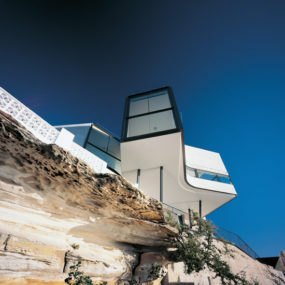 The linear voids of the home, defining each level, resemble fissures in the rock face. 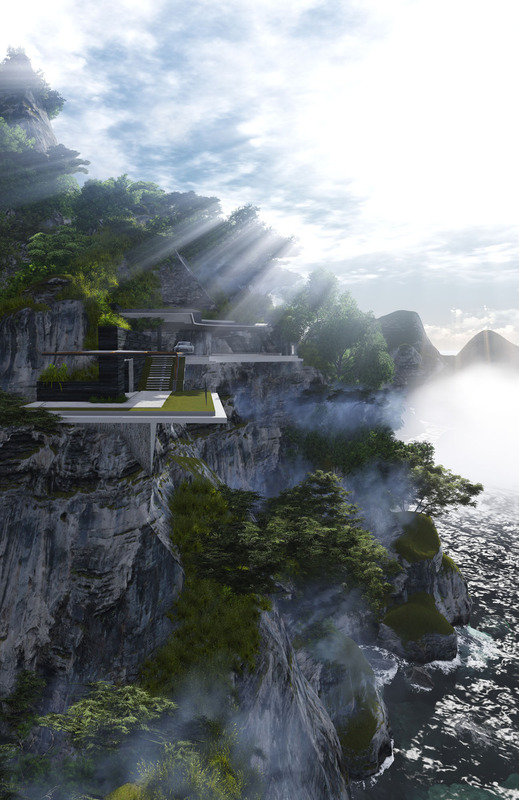 The concrete walkways and lush green flora continue the connectivity to the rock face. Even the pool resembles a natural water element traveling across the land before merging with the ocean. 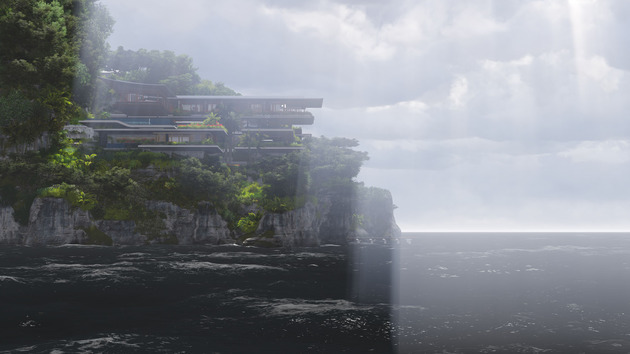 Everything has been thought of. Just as a stream has shallow banks and a deeper centre, the architect has designed this pool to have the same via underwater bench seating wrapping the perimeter of the pool before dropping down into a deeper swimming lane. 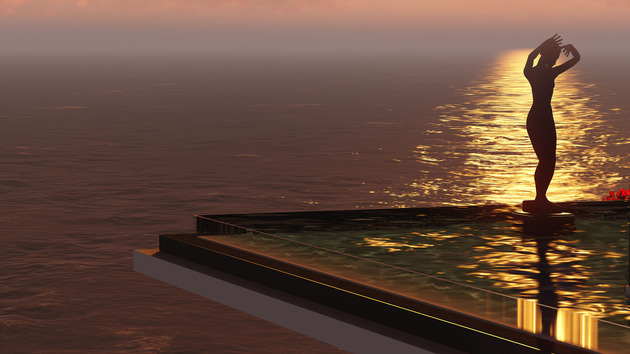 Tempered glass holds the water in place on the deeper sections of the pool. Carefully placed columns support the floors above the pool as if the columns are tree trunks rising from the edge of the water and the volumes above are the tree canopies offering shelter to those below. 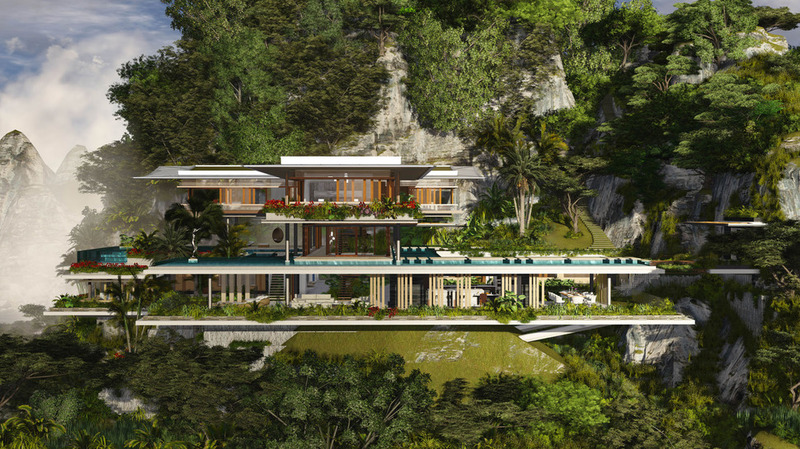 It’s an ideal melding of man made and nature, or as Martin Ferrero Architecture explains it, its a “Poem to the horizon framed by the sea”.